My favorite part about Henna Night—put on by the Muslim Student Association—had to be the Samosas. These fried pastries filled with onions and potatoes have an intense spicy kick to them. I might’ve eaten four. Other than just the delicious food, there was much to be learned at this year’s Henna Night, which was last Thursday, Nov. 14 in the Umbrella House. There were multiple student Henna artists there giving students tattoos on their forearms and hands, with varying designs. Most people opted for traditional Indian styles, of which there were several example sheets. Other students choose their own designs for their tattoos, like a dream catcher or a diagram of a molecule. Safiya Syed, Troy sophomore and the president of the MSA, and Laxmi Kotha, Troy junior and secretary of the MSA explained cultural significance of Henna and some of its uses. The dye for a Henna tattoo is from the Henna plant and is created by mashing the plant into a paste, releasing the lawsone molecule that enables it to color skin. There are also many different names for Henna in different cultures, indicating that it had various points of origin. 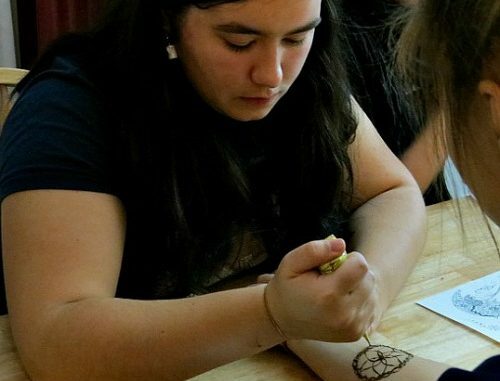 “You can find Henna from India all the way to Africa, and there are different types of Henna, as well as specific designs for different cultures,” Kotha said. Henna is very closely tied with certain cultural events in India. Eid is a holiday celebrated in by Muslims worldwide that marks the end of Ramadan, the Islamic holy month of fasting. Henna is also closely associated with weddings. For brides, Henna is placed on the palms and back of the hands and the arms, as well as the feet. “They say that new brides don’t have to work at the house until their Henna goes away, which could be a couple of weeks,” Syed said. Henna is not just used for holidays and wedding anymore though, as Kotha points out. The art of Henna tattoos is very far reaching in Indian and other middle-eastern and African cultures that reach back into the Bronze Age. But Henna has been able to transcend the cultural barrier into popular American culture today and can now be enjoyed by people of all cultures and ethnicities.